Longevity and Performance are essential elements to investment results, and in 2016 Thomas Kee, President and CEO of Stock Traders Daily, managed the 4th best strategy in the world according to HedgeCo. That Strategy is the LETS Strategy, which returned 108% in 2016. 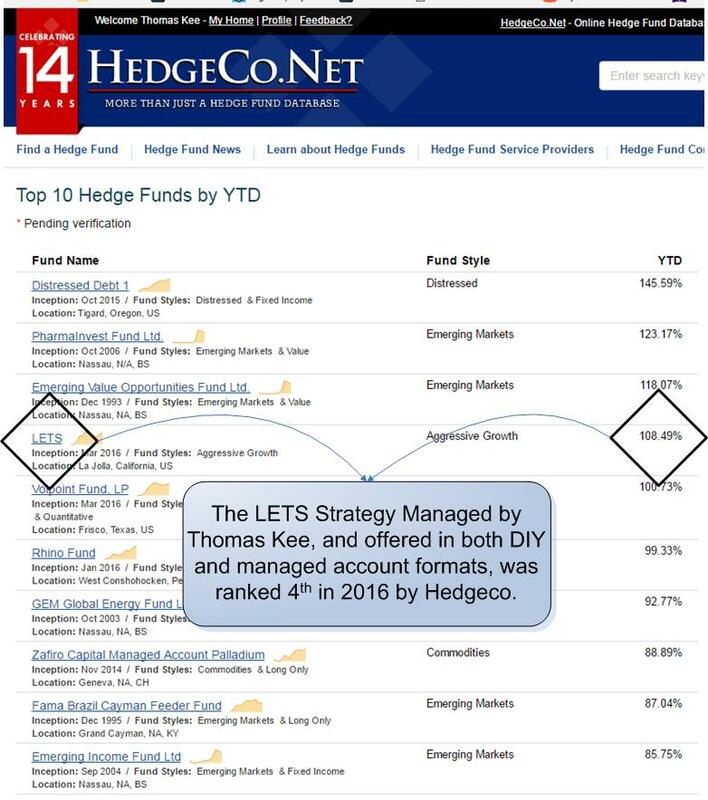 Additionally, and again according to HedgeCo, which ranks thousands of Hedge Funds and SMAs across the globe, Thomas Kee Managed the 5th best Strategy in the world in 2015, that is called the Sentiment Table Strategy, and it returned 70.5%, but it is the way it did it that matters most to investors. This strategy only made 21 trades, and it was in cash 68% of the time. Both of these strategies are offered in DIY format as well through Stock Traders Daily, where investors can also watch them and evaluate them in a real-time environment. The Rankings are shown below. Disclaimer: Investing in the stock market involves a high degree of risk and investing in proactive strategies which engage in trading activities have increased risks that are not suitable for some investors. Substantial financial losses can occur and investors should consult with their personal Financial Advisors before making any decisions to invest.